Dark Horse Comics and 20th Century Fox Consumer Products are bringing new ‘Predator’ universe comics to the public this year. The series which stems from the popular 1980s action flick starring Arnold Schwarzenegger, has developed into a series of films, novels, comics and plenty of crossover universe material. To celebrate thirty years of this franchise we can expect a new series, ‘Predator: Hunters’ and a hard cover collection entitled; Predator: The Original Comic Series. Predator: Hunters, will be five issues long and comes to us courtesy of Dark Horse’s own senior editor, Chris Warner, alongside artist Francisco Ruiz Velasco, whose previous work includes Pacific Rim and Hellboy II. In this new story, characters from past Dark Horse series team up against the extraterrestrial interlopers, apparently the Predators themselves, will become the hunted – when dangerous humans start hunting them. 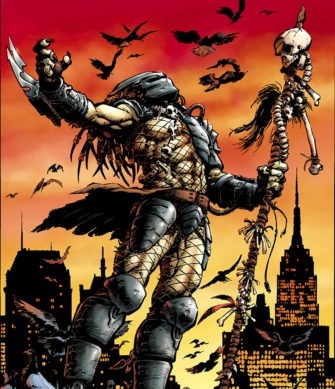 Predator: The Original Comic series, comprises of Mark Verheiden’s Predator stories from 1989 to 1996 and is presented in hardcover format. This is similar to last year’s Aliens Original Comic Series which also celebrated a 30 year film anniversary. This 2017 re-issued series will include Predator: Concrete Jungle Issues 1 to 4, Predator: Cold War Issues 1 to 4 and Predator: Dark River, also issues 1 through 4. ‘Concrete Jungle’ follows the alien trophy hunters to the streets of New York City, ‘Cold War’ involves a crash-landing in Siberia and ‘Dark River’ continues on from the events of Concrete Jungle, with the protagonist from that series looking into the events from the aftermath of the first Predator film. The first issue of Predator: Hunters goes on sale May 3, 2017. Predator: The Original Comics Series- Concrete Jungle and Other Stories goes on sale June 14, 2017.